At New Hampshire Hostas we grow our hostas in generously sized 4 1/2 inch pots for our large varieties and deep 3 inch containers for some of our small and all of our miniature hostas. 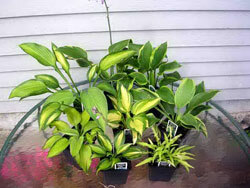 We also offer starter hosta plant plugs at a 40% discount over their larger/older counterparts. We also grow some of the larger hosta cultivars in Two Gallon containers for a larger plant now! Before 2016, we shipped the hostas in their containers to all states except a few on the west coast due to strict agricultural laws. In 2016 we were notified by the state of NH that we needed to bare root the plants shipped to nearly half of the country as the laws are becoming more strict about sending soil from state to state. This is out of our control and we apologize for any inconvenience but we must follow the rules. Please see our Shipping & Returns Page for a list of states that we have to send bare root plants. Shipping container grown plants instead of bare root plants means that you receive a hosta plant that's ready to take off in your garden from the day it arrives. There is very little transplant shock. For the states that we have to send the plants bare root, this is done to order so the plants are not sitting in a storage facility. We take the container plants and bare root them per order and ship them immediately so that they are not without soil for too long. You are getting the same container grown plants that we grow for everyone but we bare root them. Most bare root orders are delivered within 2-3 days and the plants don't skip a beat! See our Growing Tips Page for directions on how to handle bare root plants. Our hosta and companion plants are neither pot bound nor recent transplants. What we ship are hostas and shade perennials that are firmly established in their container and ready to be transplanted into your garden. What Are Starter and Elle Plant Plugs? These are the plants that are supplied to retail/growers such as New Hampshire Hostas by tissue culture/wholesale growers. The soil of the plugs is held together by elle paper, hence the name. We sell the starter/elle plant plugs in two sizes. The root ball of the 65mm elle plug is 2.5" wide and 3.25" tall. The root ball of the 35mm starter plug is 1.5" wide and 2.75" tall. The size of the plants of both sizes depends on individual plant characteristics. The starter plant plugs are approximately 1 year younger than their larger counterparts and are just as easy to plant and grow. We strive to send every plugs with sufficient moisture to last through shipping. Upon delivery of your order, inspect all plugs for soil moisture. Water any plugs that appear to be dry immediately. If the Elle paper is dry, then the plug is drying out. If the Elle plugs are to be held for a period of time before transplanting, check the plugs regularly to ensure they are evenly moist. Do not let plugs dry out. Just before transplanting, re-check moisture level of all plugs scheduled to be transplanted. Ensure that plugs are thoroughly moist before transplanting. After transplanting, make sure the soil does not dry out causing the plant to wilt. Keep soil evenly moist for the first 6-8 weeks. We Now Offer Our Two Gallon Hostas! Our extra-large hostas are grown in a two-gallon container and are not chopped or cut in any way, unlike field-grown material. Field-grown hostas that get cut can often be smaller the next season because the crown gets disturbed. Our two-gallon hostas are not shipped in the container as the soil weighs too much and it is not economical to ship with all the soil.We have to remove some of the soil (not all of the soil) from the roots to be able to ship them at a reasonable cost! We will not disturb the crown and these extra-large hostas will be easy to plant in your garden. 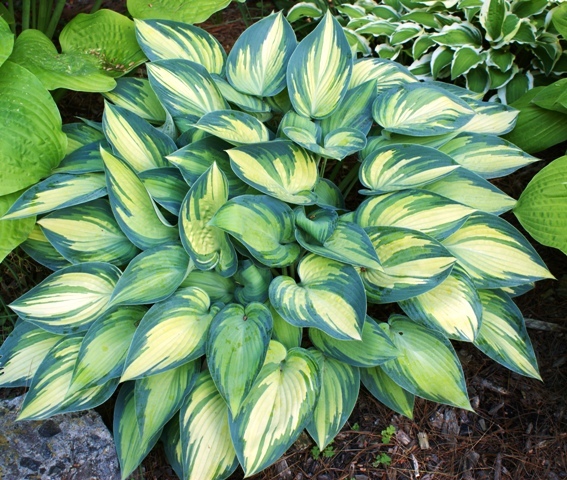 All of the extra-large hostas are at least three-eyes and some are more than five-eyes. 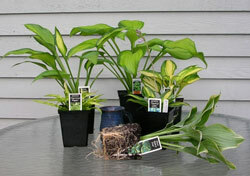 The Hostas and Companion Plants are generally shipped from late February to late October during the growing season. Of course, the exact shipping date depends on the weather and your location. We can ship year round but plants shipped between mid October and mid March are dormant with no leaves. Our hostas are one to three eye perennials depending on the variety. Larger hosta cultivars tend to be single eye while smaller hosta cultivars are more likely to have multiple eyes. Our hostas may have come from either division or tissue culture, but in either case, we guarantee them to be true to variety. We will replace or refund any plant that does not appear to be true to name. Please remember that the hosta characteristics listed in our descriptions refer to the hosta plant at maturity which can take five or more years for the larger varieties. Actually, this is part of the hosta's charm. Each year in your garden, not unlike trees, they mature and become an even more appealing part of your garden. Giant and Large hostas can take 4-7 years to reach their mature listed size. 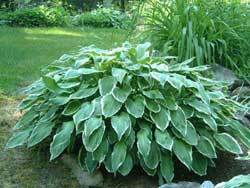 Small and Medium hostas can generally reach their mature size within 3-5 years. Note: Hostas will not reach their true potential when grown in poor, dry soils. See our Growing Tips to achieve the best results with your new hostas. Hosta sizes are based on their mature height. The above size ranges reflect the fact that any specific hosta cultivar will generally grow a few inches taller in Northern climates as compared to Southern climates. The larger the hosta, the greater the spread between heights in the North and South. Enjoy the beauty of these lovely shade perennials! Order Your Hostas Today!